When I think of T-Mobile, there’s one thing that comes to mind. It’s not the phone or the services. It’s not even a “thing”. It’s Carly Foulkes. Before Carly Foulkes became the “T-Mobile Girl”, T-Mobile tried to hock it’s product and services using Catherine Zeta Jones. This worked for a bit. I used to go “Hey. It’s Catherine Zeta Jones. I remember her from that one trailer of Entrapment and Zorro and… Um… Oh yeah! She’s with Michael Douglas, right? (Frown on face)”. I also remember going “Yeah. I would totally buy a phone if Catherine Zeta Jones tried pitching me a killer family plan at my doorstep and I don’t even have a family!”. But Catherine Zeta Jones was a familiar face. She brought baggage of her work. The brilliant minds at T-Mobile knew this and decided to show the world a new face: Carly Foulkes. Carly Foulkes works because she’s fresh. I remember seeing her first commercial (no, I don’t remember the exact product/service) and going “Wow… Who the heck is that?!?”. I instantly googled “new T-Mobile girl” and discovered the name to my newest crush. Adjectives to describe Carly include: slender, brunette, adorable, the girl next door, perky, and Oh! She’s Canadian! Isn’t it great that T-Mobile decided to go beyond the borders of the country it was serving and find such a cutie? For those interested in catching a glimpse of her life behind the scenes, she even uses Twitter (@foulkescarly). Usually sporting white/magenta and heels in TV spots and bus posters, I wonder if Carly Foulkes recognized as often in public if wearing different color schemes. I think AT&T would take the hipster approach for Carley Foulkes. We all know AT&T was previously the exclusive carrier for the Apple iPhone which revolutionized the mobile handset industry. Although the exclusive deal is no longer a bragging right, AT&T still champions the iPhone more than any other of its other smartphone handset platforms (Android/Windows). The iPhone is pretty much THE phone to own for high school students, college students, recent graduates, gamers, and professionals that demand connectivity to social networks at all times. This is the kind of customers that can’t remember the last time they talked but texted their bestie while driving through a red light. Hair: Carly Foulkes would probably trim her hair a bit. The longest it would be would be shoulder length. Carly might even be wearing a bob cut with bangs of course. Her hair would certainly be adorned with some type of accessory like a thin head band or whatever trendy thing the girls wear at Melrose/Silverlake. As far as hair care goes, it doesn’t need to look 100% professional. It will look great despite the fact it took only 5 minutes to brush. It’s even possible Carly Foulkes would be wearing a cabbie hat. 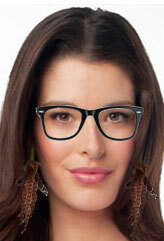 Face: Carly Foulkes would certainly be rocking plastic frame eyeglasses. This is a no-brainer. As far as earrings go, she might be wearing feathery type earrings (Natural of course. No synthetic colors). Clothes: There are a ton of combinations for Carly Foulkes to chose from. Luckily, none of them have to be blue/orange since she’s going for a hip look. There’s no need to conform to a corporate palette! A cuffed long sleeve plaid top, suspenders, and jeans is one possibility. A different commercial might show Carly Foulkes in a stripped v-neck shirt (the v-neck helps expose a portion of the artistic ink she’s got), skirt, and patterned stockings. Shoes would definitely be wearing flats and never heals. Verizon’s latest marketing campaigns are all about Android. Even though it also carriers the iPhone, Verizon is credited for making “droid” a term people use when they really should be saying “Android”. The commercials are always done in the key of Skynet with red and black. There’s nothing pretty about Verizon’s marketing campaign. In fact, it almost makes me scared that I’ll walk into a store one day and be served by robots instead of humans. Hair: Carly Foulkes hair would be jet black or bright red. Either way, her hair would be slick (think Trinity from The Matrix). Face: Pale. 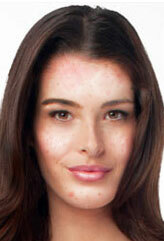 Her complexion would be extremely fair to convey she is void of emotion and her transformation to a robot is nearing. 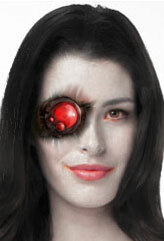 Carly Foulkes might also have some optic system on half of her face like a Borg from Star Trek. Clothes: Her clothes would be tight black vinyl with accents of red. If Verizon decides to embrace the cyborg appeal, she might have a few limbs that are exoskeleton. Her shoes are obviously not modular. They are connected to her single peace armor/suit since all her thoughts are translated into bionic movement via a processing unit within the suit. 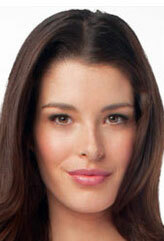 Other: If Verizon was smart, Carly Foulkes’ voice should stutter like Max Headroom. Sprint is the unexciting underdog of the four major carriers. It doesn’t really have much personality right? When you think of Sprint, you think of value service. We all hoped the Palm Pre would make a triumphant splash in the mobile handset market but things just didn’t pan out that way. Sprint has definitely become good buddies with Android handset makers, but there isn’t anything distinct about the way they show off products. As such, this becomes the most challenging carrier to work with in this. Hair: Carly Foulkes’ hair would be normal yet professional. It might be in a bun or ponytail. Clothes: Her clothes aren’t from a thrift shop (AT&T) or made by an engineer (Verizon). They’re bought from a mall or Target. They fit fine and evoke feelings of highly accessible platonic friendship. The colors are safe and inconspicuous. If she’s wearing a skirt/dress, she’ll wear plain stockings to appear professional and non-threatening. This entry was posted in Mobile, Off-Topic and tagged @foulkescarly, ads, advertising, AT&T, Carly Foulkes, crush, imagine, Sprint, T-Mobile, Verizon Wireless on September 6, 2011 by Mark Azali.